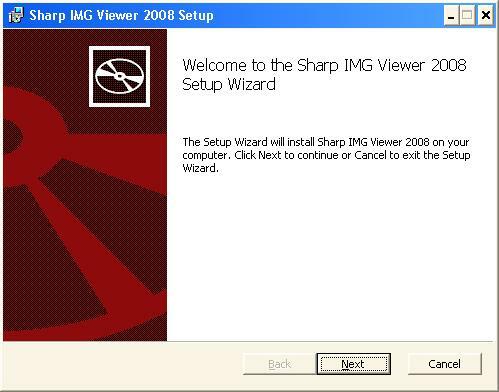 This topic describes how to install the Sharp IMG Viewer 2008. Prior to the Sharp IMG Viewer 2008 install/update you should quit all launched instances of the application. For updating it is not necessary to uninstall the Sharp IMG Viewer 2008 first, since you can easily install over the old version. Sharp IMG Viewer 2008 is designed under the .NET Framework 2.0 or later. Before launch Sharp IMG Viewer 2008 setup package you need to install on your computer the .NET Framework 2.0 redistributable. It is available as a stand-alone executable file. To download the file go to Microsoft Download Center and download .NET Framework 2.0 Redistributable Package. As a result of downloading you will receive a file named Dotnetfx.exe. Note that administrator privileges are required to install Dotnetfx.exe. If you have previously installed the later .NET Framework version, .NET Framework 2.0 SDK or Microsoft Visual Studio 2005/2008, you do not need to install the Redistributable Package. Please use Windows Update to check for any critical updates to the .NET Framework. Sharp IMG Viewer 2008 package includes WIA Automation Layer component to make it easy to acquire images on digital cameras, scanners, or Web cameras. Beforehand you should ensure you are logged in as administrator. WIA Automation Layer API requires Windows XP Service Pack 1 (SP1) or later. Earlier versions of Windows are not supported. After downloading the Sharp IMG Viewer 2008 package start the installation by executing the SharpImgWixSetup.msi file from the location where you saved it. Follow the instruction on the screen. You will be led step-by-step through the installation process.